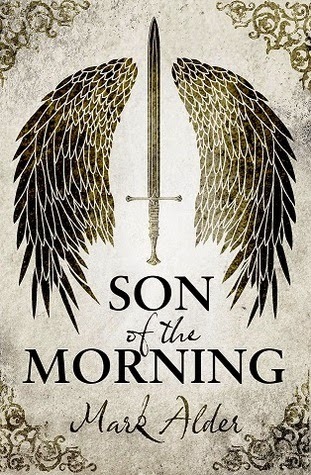 I have now read three novels by this author - Girlfriend 44 by Mark Barrowcliffe, Wolfsangel by M D Lachlan, and now this, Son of the Morning by Mark Alder (I don't think he'll mind the reveal of his pseudonyms - he's pretty open about it!) Out of the three, this is undisputedly, and by a long way, the best. It is a fantasy novel embedded within historical events and, while I've seen this done before, I don't think I've seen a world built so realistically within fantastical terms. Honestly, it makes you believe that angels did indeed fight on the side of righteous kings. Although I sometimes got my devils and demons mixed up - they are very different entities in this novel - I was gripped from the beginning and found myself utterly engrossed in the world of high and lowborn men, affected by their worship of either God, Lucifer or Satan. 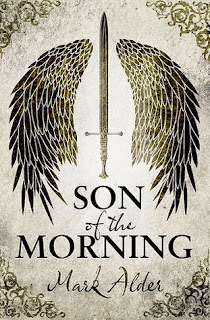 With astonishing battle scenes and some truly lovely prose - especially during the materialisation of the angels into their chapels - Mark Alder has achieved a rich tapestry of a novel. So why not a five star read? For me personally, I find that Mark (in all his authorial guises) writes very entertaining and three dimensional characters, and yet somehow I'm not drawn to them. I feel as though there is a veil between the reader and the character that prevents them being completely engaging. They are rather clinical instead of being warm, and I felt the lack. Although Montagu, Edward, Osbert, Charles and Dowzabel had moments of dignity and honour, ridicule and humour, there was little of the emotion behind the character, in my opinion. Despite this, I eagerly read to the end of this beast of a novel, and would very much welcome more in this world. Definitely recommended. What the hell just happened? Is Floor-to-Ceiling Books back in business? Given the circumstances, this makes me sad AND happy.